JK PPL® Therapy is a safe and effective alternative to expensive chemical, laser and surgical procedures and it is is much more affordable. It may be superior to injectable fillers for the treatment of the most superficial fine facial lines! It is also used to treat the symptoms of SAD (Seasonal Affective Disorder). JK PPL® Therapy is one of the most non-invasive ways to aid in skin rejuvenation and repair and is suitable for men and women. This therapy was developed by NASA to improve the healing of wounds and tissue growth in space. Our JK PPL® technology which incorporates Led Light Therapy uses 100% safe wavelengths of light to stimulate cells, increase circulation, and promote collagen growth. JK PPL® penetrates deep into the dermis layer of the skin, energizing the cells, stimulating collagen and elastin, giving the skin back its youthful look. 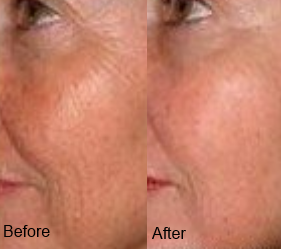 If you have a series of treatments you will have anti-aging results. But JK PPL® Therapy is not just for anti-aging. It treats a variety of skin problems, conditions and diseases. Also works to repair the skin affected by skin conditions such as acne, rosacea, eczema, psoriasis and many more. Why is this the best treatment to pick for skin rejuvenation? It is one of the most effective and non-invasive ways to aid in skin rejuvenation and repair. There is no pain and no downtime. There are no side effects and it is suitable for all skin types. PPL® Therapy penetrates deep using 100% safe wavelengths into the dermis layer of the skin, energizing the cells, stimulating collagen and elastin, giving the skin back its youthful look. It is a quick and simple treatment and is FDA approved. It does not cause damage to dermis or surrounding tissues like other light based treatments. It is not a laser and there are no harmful UVA and UVB. All our rooms are completely private, modern and comfortable with free Wifi so our clients can relax as they get their individually tailored treatment. How often and how long are the led light therapy treatments? Treatment times vary depending on what you want to treat, but generally they last 20 minutes per session. For best results we recommend two 20 minute sessions per week for six weeks. Missing scheduled sessions will reduce the effectiveness of the therapy. To prolong and maintain results, we advise a session once a month. The therapist applies therapeutic light to the treatment area ensuring that the light is correctly positioned for optimal results. Sometimes there is a slight warming sensation but overall treatments are painless, simple, relaxing and quick. Everyone’s skin varies, but most people feel and see a difference in about four treatments. Because of differences in damaged skin, some people will see the benefits almost immediately and others will need more treatments. Combining JK PPL® Therapy (Pure Penetrating Light) with our JK Skincare Range will give you the best possible results.